Jack Bell Gallery is pleased to present a new body of work by Los Angeles based contemporary artist Karen Hampton. In her second solo show with the gallery, Hampton continues to explore how the African Diaspora has spread cultures around the world. 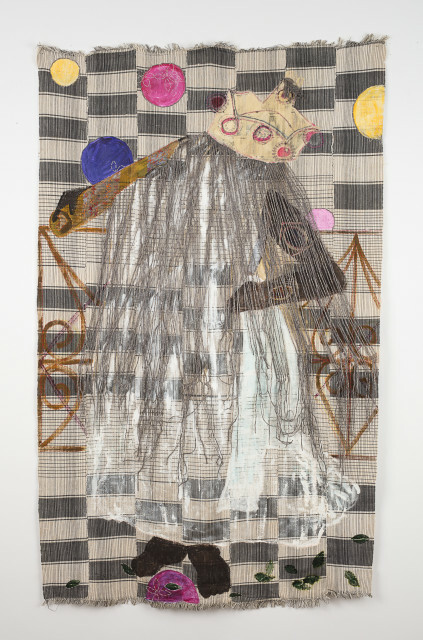 ‘Shape Shifter’ looks at the expressive power of West and Central African textile, its ability to transfer magic and act as conduit from gods and ancestry to the dark days of slavery. Hampton was born in 1958, Los Angeles, USA, where she continues to live and work. The artist has been included in exhibitions at the Honolulu Museum of Art, California State University, Muskegon Museum of Art, Michigan, University of Massachusetts-Dartmouth, and San Jose Museum among others. Awards include the Sacatar Foundation Award, the Fleishhacker Foundation Eureka Fellowship, Marin Arts Council Award, and the Ellen Hansen Memorial Prize. Hampton graduated with an MFA from the University of California, Davis.